We are proud to present you a very talented lady, Katharine Yeung from Hong Kong . Katharine responded on our blogpost visitors from all over the world and now you can read her sewing story too. After graduating from fashion design school 2 years ago, I worked at a bridal studio in New York. I learned a lot about pattern making and some sewing technique. Now I’ve returned to Hong Kong where I was born, it had not been easy to find a job I love (compare to the vibrant design scene in NY). So a month ago, I decided to start my own collection, work on something I truly enjoy, and see where this will take me. I love bridal and evening, but I need to have something more wearable and profitable 🙂 So I’m creating a small 9-looks casual-evening collection, with dresses, tops, skirt and pants. I started this project with a little strapless A-Line dress. This dress has tons of seams; each panel will be in contrasting colour (dark area: some type of silk, think duchess, shantung or taffeta that has a bit of shine… the grey area will be matte: black/grey organza overlay on whatever I used on the dark area.) It will have a bustier inside, as I can’t stand those low-end garments without a proper structure inside. This is how I stumble across the Sewing Divas blog. Google took me to your post of December 31, 2007 (Evening wear, bustier and skirt). Gorgeous work! Even it wasn’t exactly the type of bustier construction I was searching about, your blog just took my breath away! I loved loved loved all those technique you showcased on your blog, it’s not easy to see someone who blog about their sewing secrets! Not to mention your techniques are so professional/couture (in contrast to some home sewing technique). Your blog is just too nice to be true! Back to what I’m sewing. Here is work in progress of the toile of that strapless dress. The original sketch has a chiffon draped panel that rest on the side, with one panel that can be flipped up and rest on shoulder (for those who want more than a strapless look). However, after stitching up the toile, I’m obsessed with all the seam detail and the dress just look so sculpted and 3-dimensional, that I felt it might be a shame to cover up all those seams (and the cute in-seam pocket! ), even it’s chiffon. So I’ll make that decision later on when I sew this dress in the real fabric choice, and keep that chiffon option in case the seams are not laying as smooth as I want it to be. I’m sewing in my tiny bedroom in Hong Kong with an IKEA table and a Janome sewing machine. I don’t have a huge kitchen table, but we do have an un-occupied room in our apartment…. so yea, I’m one of those who do their pattern and cutting on the floor. Hopefully one day I can afford to have my own studio with a giant table! Since I’m prepared to re-use those pattern, I tried not to fold them (the pattern paper quality is pretty bad… (Does anyone know where I can find a more sturdy pattern paper in Hong Kong?) I don’t have that extra money to buy a bunny hole puncher and pattern hooks yet. So I clip the pattern with binder clip and hang them behind the door. And this is my cheaply made ham…. I swear to myself, I’ll buy a real tailor’s ham once I sold the first piece in my collection. You can’t judge this book by its cover. I would not have purchased this pattern based upon the pattern envelope. But I have taken a short workshop with Connie Crawford and have many of her text books. I know that she knows her stuff, I’ve seen her patterns made up and how they flatter larger women. And I know she is an excellent pattern maker so I took a chance that this might be the blouse I’ve been looking for and made up the large in the Miss sizing range. 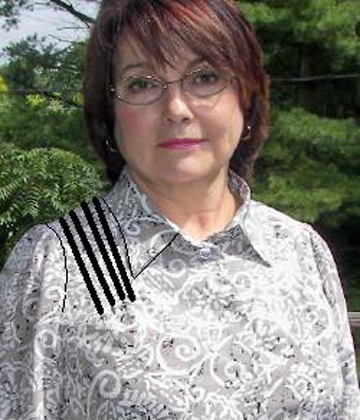 I have done an in-depth review of it at PatternReview.com because it is a sweet blouse pattern, well drafted and graded and very relaxing to sew up. There were some problems with the instructions but I hope I have provided the fixes for them in my review (link supplied above). 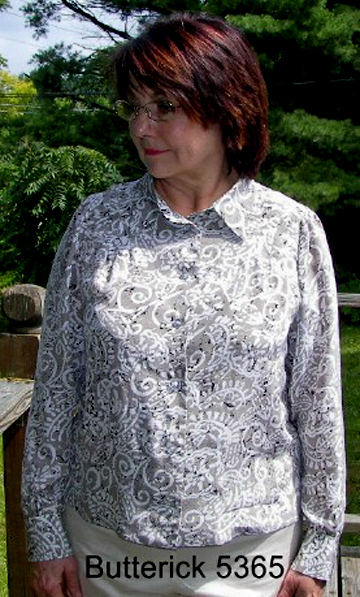 I made View A darts from the shoulder with the long sleeves from View B. I used a well aged silk crepe de chine from the stash. The illustrations show a small collar, especially in the Version B drawing. Not true! 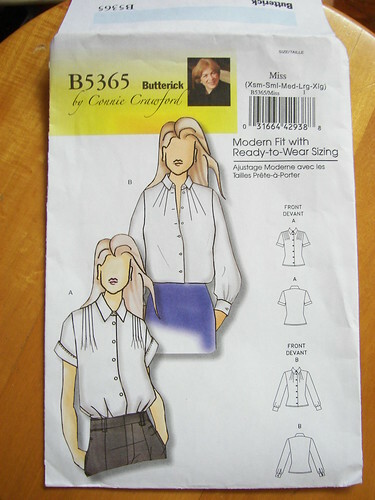 It’s a nice normal collar and the one pattern piece is used for both versions of the blouse. And those long darts over the bust? They actually release about 1.5″ above the second button. I’ve marked up the stitched lines so you can see them more clearly. The collar has a very nice shape to it. It curves up over the shoulder and is nicely rounded in the back but the illustration shows it to be a straight, unshaped collar. 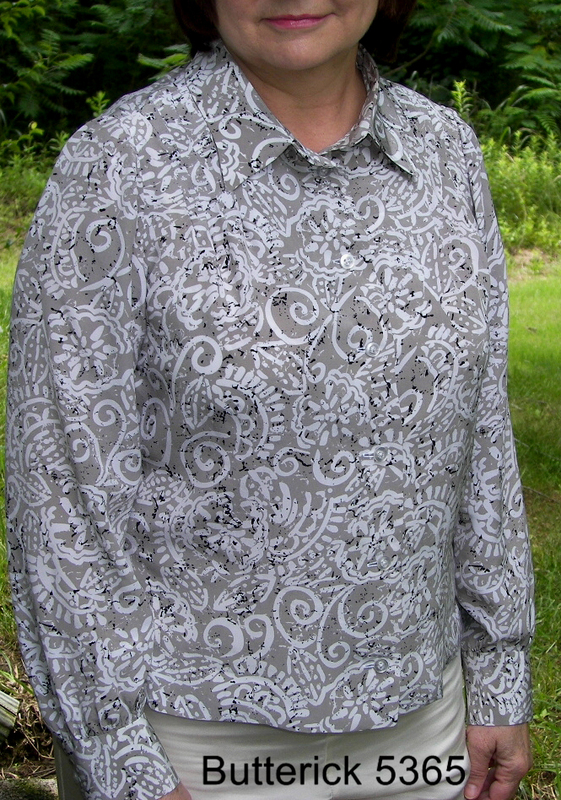 The seam allowances are 3/8″ used for the neckline, collar, center front and cuffs. Smart! It makes these pieces easier to join and to turn. The side seams and sleeves joining seams are the ubiquitous 5/8″ allowances. There are no fancy methods in this pattern’s instructions. You hand stitch the inside of the collar band and the cuffs. 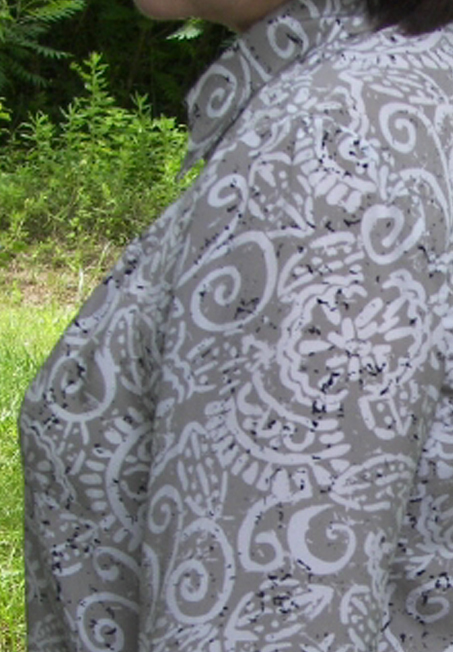 Except for the problems above, it’s a great pattern to use for your first blouse, no fancy “burrito” methods, etc. I just relaxed and sewed, slowly. The kind of simple sewing that was so needed after struggling through a kimono made without pattern pieces. I love the fit. Next time I make this blouse or a variation of it I will slant the shoulder seam down slightly and give the shoulder line an ever-so-slight concave curve. The sleeves are the perfect length for me without shortening them. The shoulders sit perfectly, the length of the shoulder seam ends right at my shoulder point. I can reach forward comfortably. It’s just perfect. It put it on and I get happy. The button placement is interesting, too. The first button down the front is 1 1/4″ from the collar band so that it can be buttoned with a nice and modest spread to the collar. The second and third buttons are 3 1/4″ apart so that the third is exactly placed horizontally between the bust points, preventing the dreaded gaposious. The rest of the buttons down the front are 3 9/16″ apart and end 2″ above the hemline so that the blouse can be worn untucked and neat. Next time I might make it a bit longer. Under that awful illustration is a very well graded and well drafted classic that provides a lovely alternative to side or waist darts.